UCCFS Round 4: Pizza (1) vs Burgers (2) – I Love It Spicy! The last of the Elite Ate match-ups with 2 of my favorite all-time comfort food choices. I have been thinking about this possible battle for a while, and I am not sure which way I will go. 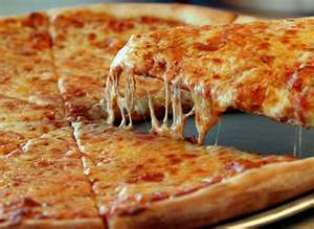 I grew up in NY and love a good slice of NY-Style or Sicilian-Style pizza. Now in Virginia I crave it more so the scales might be tilted for my choice, but I love burgers too. I have gone on stretches of eating burgers for 3-4 days in a row. 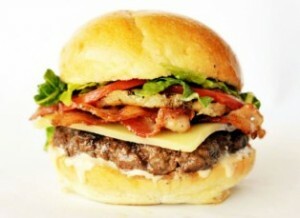 A good juicy burger, designed so many different ways is truly food comfort. I can add so many things onto a burger, not to mention in a burger, and the cheese, mmm…mmm…mmm! On pizza there are so many toppings too, but I rather have my ‘real’ pizza slice topping free. If it is one of those fast-food delivery joints, which to me isn’t ‘real’ pizza, I will add toppings just to make it taste better. Yet, if you ever have visited NY or Italy and ordered a slice, you know that besides some grated Parmesan or red pepper flakes, no toppings are necessary. We can also talk about great Chicago-style too, and while I rather have NY over Chicago, it is quite an eating experience as well. I can go back and forth all day with these two, but I still am not sure which way I will vote. What about you? Share your thoughts please. Being here in NM, I can get an awsome green chile cheeseburger any time I want, but a slice of pizza that is extremely exceptional is few a far between. Pizza it is. What can you say about burgers? An all-American staple. I have to admit that in the last couple of years, I’m getting more and more fatigued of burgers. It’s gotten to the point that the past few times I’ve gotten a big, juicy, restaurant-style burger that I couldn’t finish them. I’ve never tired of pizza, no matter what my appetite was or what time of day it was. I love NY style (my fave), Chicago style, St. Louis style (an acquired taste for many), frozen pizza, homemade pizza, whatever… so for me, pizza it is too. I do a double burger once or twice a month for the fix but when I want comfy, I want pizza just like the one in the vote photo. Cheese, thin crisp crust, lotsa sauce and sprinkles of Parmesan, smoked salt, chile flakes and dabs of hot sauce. This may sound nasty to some folks but I have a really good Pizza Hut in the hood that does good enough for this fix. I dunno Chicago vs New York style…This is Stafford TX, what do we know! Pizza Hut app, almost time for dinner. Pie…so easy, convenient, versatile, delicious, and universal. You can eat one piece or an entire pizza. It’s easy to share, and you can easily do a 1/2 and 1/2. They reheat easily, and are usually relatively as good reheated as they are the first time down…not so with a burger. And finally, pizza and beer go together much better than pizza and burgers. Not to say burgers and beer don’t go well together, but not as well as pizza and beer. Easy enough…..I’ll have a cheeseburger pizza!